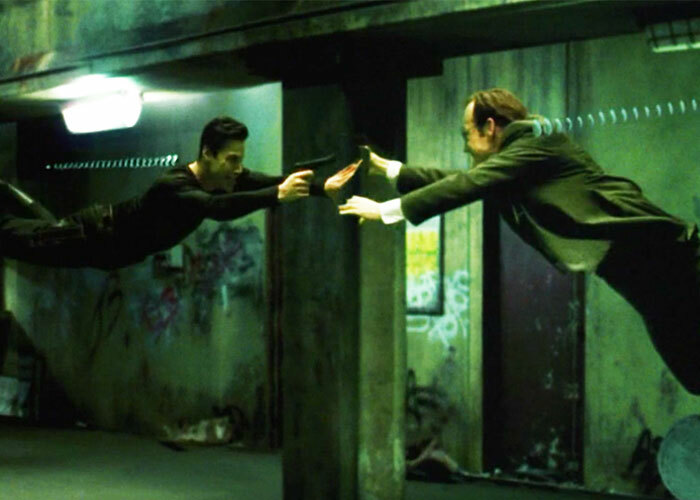 “Bullet Time” was a phrase coined after The Matrix used it iconically in this scene. 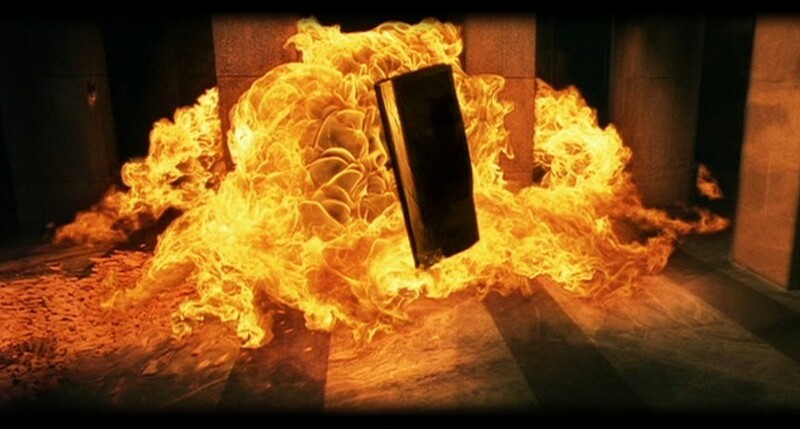 It means seeing things from a “slowed-down” perspective and although the bullet-dodging by Reeves’ Neo is the most famous use, The Wachowski siblings actually use it a couple of times in this scene. I chose the video above because it is used first and very briefly when the lift explodes. We see the creeping of the fire and the door slowly tumble in the air, until eventually everything is sped-up again. It is then used most effectively on the roof of the building. We see what “bullet time” looks like from a “normal” perspective when The Agent dodges Neo’s barrage. It is then that we get the most famous part, when the bullets fly and time seems to slow-down. It isn’t just the slow movement of the bullets which makes this scene look so cool. It is also the ripples they make through the air, highlighting the path of each individual bullet. Add to that the fact that the camera spins 360 degrees around Reeves as he bends in what seems an unnatural way to dodge the projectiles. Finally, the sequence ends with a bullet straight down the lens of the camera. One more use, very briefly, is when the Agent is finally killed by Carrie-Ann Moss’ Trinity. By this point, the impact of the scene is felt, not just for how cool and impressive it makes the character of Neo but for Hollywood movies and even video games. Many films, from Scary Movie through to anything John Woo directs, will either directly parody or heavily use “Bullet Time” while video games like Max Payne made it a clear selling point of the franchise. It is The Matrix where it still feels the most memorable and effective though. Overall, The Matrix changed a lot of things in movies but one aspect it introduced was “Bullet Time.” Used effectively here, it shocked and wowed audiences when it was first seen and then was heavily copied thereafter. Here is where it really began and arguably, has been used the most effectively.